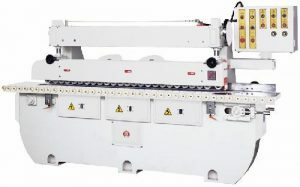 Designed for mass sawing & shaping and production for tenoner, profile edge jobs, faster and easier. Heavy sheet metal frame for durability usage. Variable speed, through feed, 5” wide rubber pad conveyor for the best finish selections. Two rows heavy-duty spring pressure rolls with track belts at top to hold the material tightly to prevent sliding during the cutting process. Equipped with industrial motor for full power cutting and sanding capacity. 6” long spindle for stackable tooling, easily adjusts and quick setup. X and Y axis mechanical readout for easy reset cutter or sander positions. Extra side roller table, it extends up to 36” to support the larger width material. Shaper head can be moved up & down, forward & backward. CS-2C2S comes with first auto jump cutterhead for clean cutting with no tear out at end. The feed conveyor equipped with back up fence for squire cutting and fine finish with one pass. CS-1C1B2S with profile belt sanding head for heavy-duty sanding and extend hours of sanding belt life.